The foregoing comparisons show, if nothing else, that the notion of time and place is connected to the ability of an observer to create a frame of reference. The Neolithic man around the stone circle and the modern astronomer looking at the period-luminosity relation of a Delta Cephei star have their belief in certain basic assumptions in common. Both individuals know that communication is a scheme based on division and movement, and that visibility is the result of a valuation that combines both fields. The understanding of a communication as a complete tetradic cycle points the way to a fresh vision. History is not only a matter of past, present and future, but also of the awareness of the valuation mechanisms derived from its division. That knowledge makes all the difference in the world. Tetradic history – which means the description of general history in a quadralectic perspective – is fundamentally different from an outlook based on lower division thinking. The main distinction lies in the addition of a personal involvement in the observation right from the start. Writing a quadralectic history, from the origin of the universe to our own existence on earth, is the ultimate challenge for a human being. It is a great thought to be part of a history, knowing that our personal contribution does matter. Because, at the edge of imagination, we know that history is written in the language of our own understanding. ‘This space in which is our world would without it be indeed a void, since where the world is not, there we must infer a void. Beyond our world then, one space is as another; therefore the quality of one is also that of the other; wherefore too this quality cometh to action, for no quality is eternal without action, and indeed it is eternally linked to action or rather is itself action, for in eternity there is no distinction between being and potential being (nor therefore between action and potential action).’ (Seventh argument of the First Dialogue in his ‘De l’infinito universo e mondi’ (On the Infinite Universe and Worlds, published in 1584; PETERSON, 2000). Bruno proclaimed the inconsistency of sense perception. ‘Sense is no source of certainty, but can attain thereto only through comparison and reference from one sensible percept to another, from one sense to another, so that truth may be inferred from diverse sources.’ The Italian scholar was also against Aristotle, because he had made other choices in the world of two-division, which led to the central place of the earth in the universe. He pitied him for his inability to grasp ‘profound magic’. Bruno’s ideas were such a threatening prospect at the time, that he ended up at the stake in 1600 AD. The European intellectual history faced half a century later a new challenge on the chronology of the earth. The Biblical story, with its sacred history based on the Mosaic chronology, came to a total of 5617 years for the age of the earth. 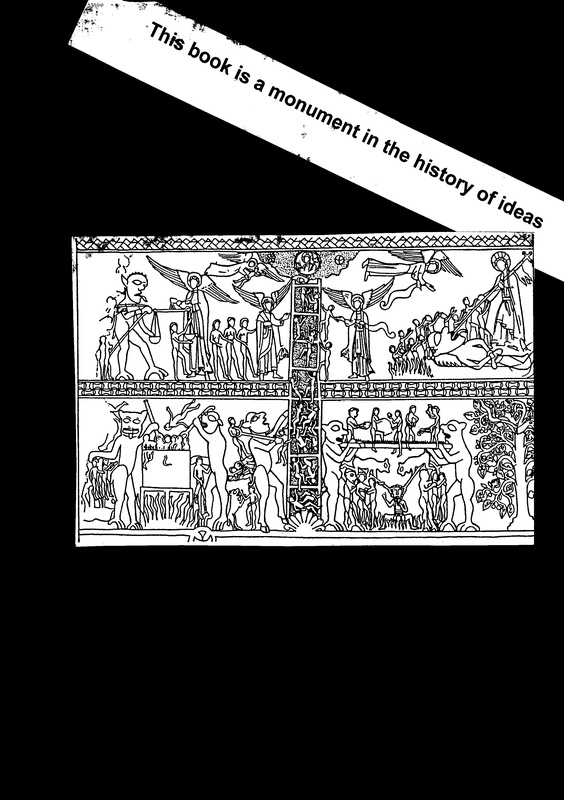 Problems arose when the duration of the Egyptian and Chinese histories became known. The continuous study of the profane history unearthed wisdom, which was more ancient than the Mosaic one. The conclusion seemed inescapable, namely that the oldest history was not in the Bible. The authority of the Book was put in jeopardy – in particular for those fixed in an oppositional frame of mind. The Dutch philosopher Isaac Vossius (1577 – 1649) added some 1440 years to the (Christian) calendar in order to turn the tide. However, his efforts did not suffice. Another professor in Leiden named Georg Horn caught – in his ‘Dissertatio de vera aetate mundi’ (1659) – the spirit of oppositional thinking. He stated the question in a black and white way: ‘either you admit that the various chronologies are all the work of the Devil and you refuse to take them into consideration, or you try to discern what, and how much, is fabulous in them’ (ROSSI, 1984; p. 158). This same professor Horn, by the way, was mentioned by Oswald Spengler in the epoch-making book ‘Der Untergang des Abendlandes’ (The Decline of the West) as the first one to introduce the term ‘mediaeval’ in the year 1667 (SPENGLER, 1917/1927). 4. The mechanical laws rule the motions of matter (Descartes). The real authority on the subject of sacred chronology (and geography) was the French bishop Pierre-Daniel Huet (1630 – 1721; almost ninety-one years old). He was, according to ROSSI (1984), ‘a master in the undertaking to draw all of profane history together into the single course of sacred history’. The present position of the earth was – as one might expect of a dualistic thinker – right in the middle of the process. After the Deluge followed the Conflagration, with the sun as an active agent in the drying out the planet. This process was still going on now. Thomas Burnet can be seen, with some imagination, as the first visionary, who drew attention to global warming! Burnet was convinced that the terrestrial globe had changed considerably since God created it. The primeval earth had a flat and smooth surface, like an eggshell. Underneath the surface were subterranean waters. A world-wide deluge was explained by the pouring out of these waters over the earth and seen as the breaking up of ‘the fountains of the great deep’. When the floodwaters had retreated into internal caverns, the earth had become ‘a gigantic and hideous ruin… a broke and confused heap of bodies.’ Burnet had an interest in the overpowering aspects of nature and looked at the material world in terms of a historical development. Bernard de FONTENELLE (1657 – 1757; his age indicate that the study of history is not an unhealthy pastime after all) played a formative role in the conception of human history. This French scholar became known from his one liners (Quotations) like ‘Toute la philosophie n’est fondée sur deux choses: sur ce qu’on a l’esprit curieux et les yeux mauvais’ (Science originates from curiosity and bad eyesight). His book ‘Entretiens sur la pluralité des mondes’ (A Plurality of Worlds, 1686) pointed directly to the insignificance of man in relation to the physical existence of the earth. He followed the earlier suggestions by the Greek philosopher Empedocles, the French bishop Nicole Oresme and Giordano Bruno that our world might be one of many possible inhabited worlds. The discovery of time in nature is an important phenomenon in the history of division thinking. It is a widening of view (and sparking of imagination) due to a reduction. The idea of aging and a slow corruption of the world originated in oppositional thinking: the good and the bad were applied to everything, including the earth itself. It meant that God – as the deputy of the Good – was shifted back in time, because it took a long time for the world to deteriorate. Some ‘geological’ works were known from classical times, like Aristotle’s book on the ‘Meteorologica’ and Theophrastus’ treatise ‘On Stones.’ Pliny’s ‘Natural History’ offered a range of practical knowledge of the earth (ADAMS, 1938). It was used by many medieval scholars. The ‘Etymologies’ of Isidore of Seville (570 – 636) and the encyclopedias of Neckam, Bartholomew the Englishman and Vincent of Beauvais were employed as sources of general knowledge, including the spiritual power of rocks. Books on natural history, like Conrad von Megenberg’s ‘Book of Nature’, several ‘Herbals’ and the ‘Hortus Sanitatis’ provided the knowledge of nature. Lastly, the ‘Lapidaries‘ have their own place as early works on the earth science. Major writers were Marbodus (Bishop of Rennes, died in 1123), Petrus Hispanus, a Portugese physician, who was probably also Pope John XXI (FORBES, 1963), John de Mandeville (Le Grand Lapidaire), Camillus Leonardus (Speculum Lapidum, The Mirror of Stones) and Anselmus de Boodt (1550 – 1632; Gemmarum et Lapidum Historia). Their books described precious stones and gave an overview of the medical and/or talismanic properties of the rocks. Wonderful stories and local lore were components of these works. 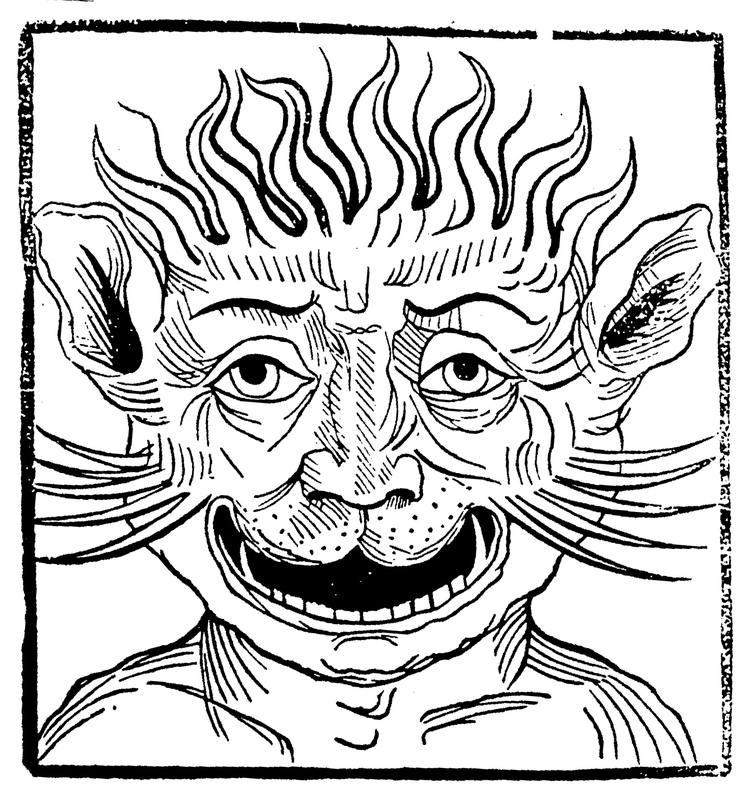 They had these fabulous characteristics in common with the so-called ‘Bestiaries’, compendiums of (mythical) animals. 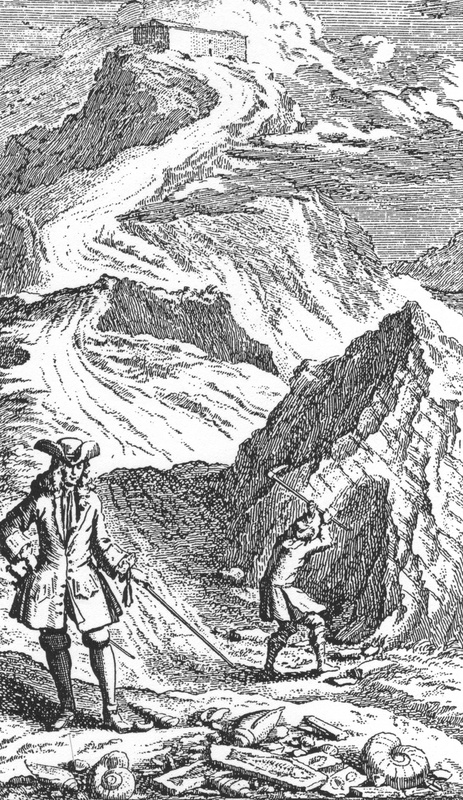 Fig 64 – An illustration of the search for traces of the Deluge in the Swiss mountains. The Swiss naturalist Johann Jakob Scheuchzer (1672 – 1733) is portrayed here by a pile of fossils, which – in his view – were formed during the Biblical Deluge. An etching from his book ‘Museum diluvianum’, published in 1716. It was at the end of the seventeenth and the beginning of the eighteenth century (of the European cultural history) that the larger fossils were first ‘seen’ as the markers of some sort of event – in general concerning the Biblical deluge (fig. 64). Before that era, rocks were mostly cherished for their practical purposes (in mining) and used for their magical or healing properties. The Swiss medical doctor and naturalist Johann Jacob Scheuchzer (1672 – 1733) was in this respect a key-figure on the edge of the latest under-standing of nature. He was born in Zürich, stemming from one of the leading families in that town (his father was a successful physician). After schooling in Altdorf (near Nuremberg) and in Utrecht, he received his M.D. in 1694. His interest in the mountains never wavered during his study in the Lowlands and after his graduation, he spent several months exploring the Alps. After his journey and a failed attempt to study astronomy and mathematics in Nuremberg, he became assistant municipal physician and supervisor of the orphanage in Zürich. This Swiss town was ideally situated for further exploration in the surrounding mountains. The municipality supported him in 1702 with money for his excursions, which took place summer after summer. His ‘Itinera per Helvetiae alpinas regiones’ (1723) gave the details of his travel, anecdotes, oddities, and antiquities. The Terrible Head in the Valley near Milcorath. St. Gallen, Stiftsarchiv, Handschriften der Abtei Pfäfers, Cod. Fab. XVI, 92rb. Das furchtbare Haupt in dem Tal bei Milcorath. 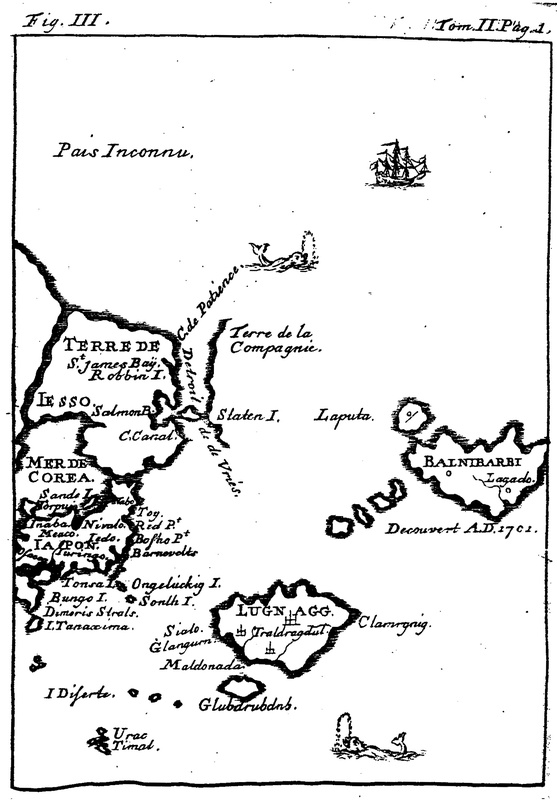 For instance, chapter five of the book, with details of the 1706 voyage, dealt with alpine dragons. He produced eye-witness accounts in the various cantons, with dates and times of encounter as well as the names and professions of the witnesses. The book fitted in a large number of travel guides published in that (Baroque) period, but the novelty was in the systematic approach. It became a reference book for later travel writers, like another ‘classic’ from the Swiss mountains written by Johann-Georg Altmann, called ‘L’Etat et délices de la Suisse’ (published in four volumes in Amsterdam in 1730). Two lines of thinking were developed in the late eighteenth century in relation to the possible formation of the earth. The first interpretation was called the Neptunist school or Neptunism. A second approach to the earth became known as the Plutonist school (or Plutonism). Their oppositional character (of water and fire) can be seen as the heritage of the dualism associated with Rationalism. The leading school was called the Neptunians and was initiated by Abraham Gottlob Werner (1750 – 1817), a professor in Freiberg. He was an eminent mineralogist and postulated the importance of water (the sea), in which all rocks and minerals were deposited. The Mosaic Deluge once covered the whole earth and the rock formations were subsequently laid as the Flood subsided. The rock layers had a universal and specific sequence. Werner rejected the belief that the geological evolution was a uniform and continuous process. Certain events from the past can be unknown to us, in his view. The great challenge of the Neptunian theory came from the vulcanists (or Plutonists). They suggested, that the major changes in the earth crust were caused by central heat and internal pressures. John Hutton (1726 – 1797) put the arguments forwards in his book ‘Theory of the Earth’ (1795/1798). 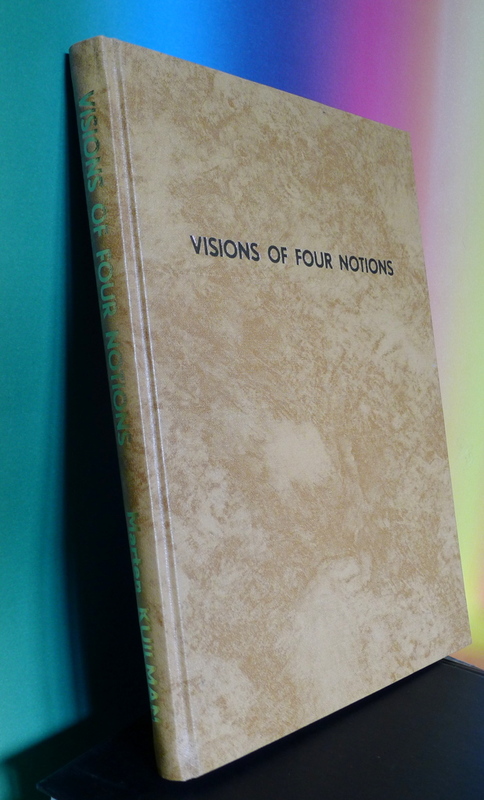 The whole process had, in Hutton’s view, a lawful regularity and the ‘operations of nature are equable and steady’. He concluded that ‘time is to nature endless and as nothing’. Stephen Jay GOULD (1987) described Hutton as ‘the all-time worst writer among great thinkers’. However, the popularization by John Playfair (‘Illustrations of the Huttonian Theory of the Earth’; 1802) helped a great deal to spread Hutton’s ideas. The Scottish scientist Charles Lyell (1797 – 1875) elaborated further upon those matters in his epoch-making ‘Principles of Geology; or the Modern Changes of the Earth and its Inhabitants considered as illustrative of Geology’ (1830 – 1833; three volumes). He had a recurrent view of time: ‘The huge iguanodon might reappear in the woods, and the ichthyosaur in the sea, while the pterodactyle might flit again through umbrageous groves of tree-ferns’. He is remembered for his opinion – which still prevails today – that the visible causes of geological change are of the same kind and intensity as those that have always acted. The principle – known as uniformitarianism – stated that the present is the key to the past. The notion that magma was a molten rock from the inner parts of the earth, and not a sedimentary deposit sealed the faith in Neptunism. The priority of volcanoes and massive cataclysmic events gave rise to a further insight in the history of the earth, called catastrophism. Catastrophism was highlighted around 1800 by the French naturalist George Cuvier (1769 – 1832). He noticed that fossilized specimen suddenly disappeared from the geological record. His study of the rocks around Paris revealed sudden breaks in the sequence, which could point to catastrophic events. He believed that the earth was several millions years old. These ideas were not endorsed in England. Scholars in that country busied themselves with a search to bring the geological sequence in concordance with the Biblical story and uniformitarianism (and gradualism) in general. The influence of major interruptions (other than the Flood) were played down in the later part of the nineteenth century and the first half of the twentieth century. However, catastrophism was back on the geological agenda in the 1950’s when Immanel Velikovsky (1895 – 1972) painted a science-fiction type of scenario of the destruction of the earth by extraterrestrial forces (Worlds in Collision). A scientific paper by Alvarez et al (in 1980) suggested that a comet struck the earth at the end of the Cretaceous period. The massive impact (west of Mexico) might have been instrumental in the extinction of many animals, including the Dinosaurs. 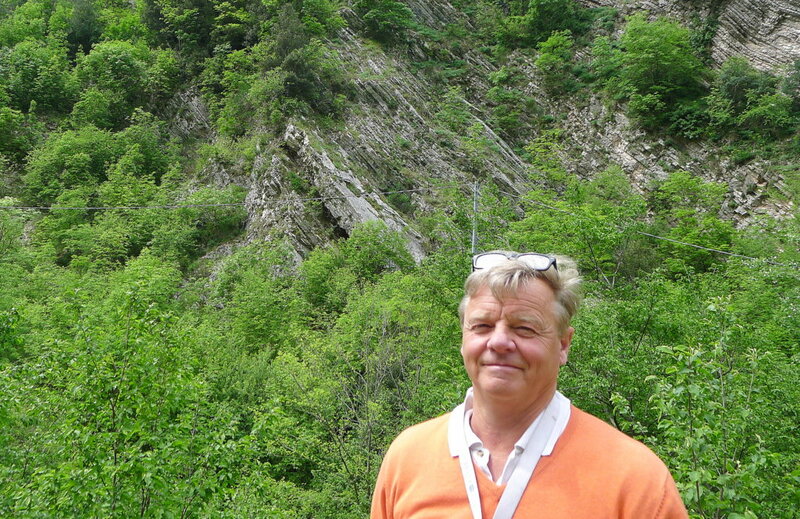 The writer at the Bottaccione Gorge near the town of Gubbio (Italy), a geological hotspot (May 2014). 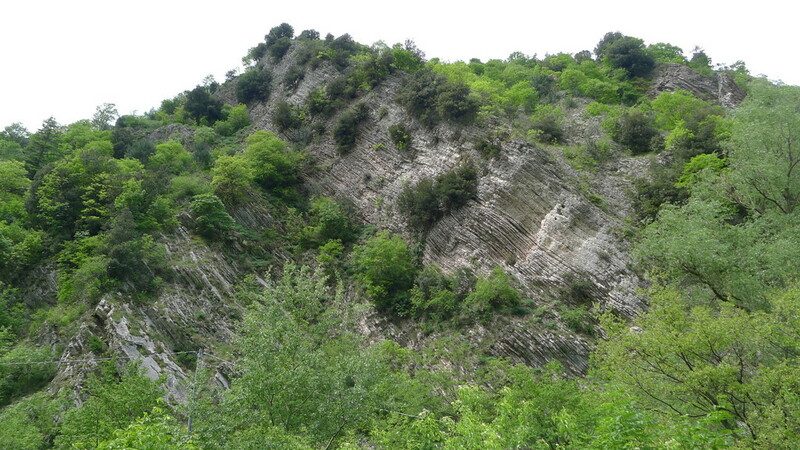 Gubbio is also known among geologists and palaeontologists as the discovery place of what was at first called the “Gubbio layer”, a sedimentary layer enriched in iridium that was exposed by a roadcut outside of town. This thin, dark band of sediment marks the Cretaceous–Paleogene boundary, also known as the K–T boundary or K–Pg boundary, between the Cretaceous and Paleogene geological periods about 66 million years ago, and was formed by infalling debris from the gigantic meteor impact responsible for the mass extinction of the dinosaurs (Wikipedia) (Photo: Marten Kuilman, May 2014). In hindsight, it is clear, that the creative-intellectual events around the year 1800 in Europe marked a formidable leap of imagination in human history. BOWLER (1984, p. 14) noted that ‘increasingly, the suspicion has grown that scientific knowledge is not just a matter of gathering new facts but is also influenced by the cultural and social environment within which scientists work’. Man became to understand its own presence, as being part of the subjectivity of nature. I believe that the four-fold way of thinking was responsible for this change.